The Victorian splendour of Queenscliff is striking and extremely well-preserved but modern era of surf and sun is restored as the Federation Track runs through coastal reserves and along broad, golden surf beaches teeming with surfers. At Jan Juc, tall golden cliffs tower over narrow beaches with some of the best surfing in the world at Bells Beach. The Surf Coast Walk wanders along these dramatic cliffs and at Ironbark Basin it rambles across a huge forested amphitheatre behind Addis Beach before the giant sandstone cliffs return at Anglesea North and slope gradually down to the Anglesea River basin. While crossing the outlet of Thompson Creek near Breamlea there is no hint that this is the beloved Karraf, home from 1802 to 1835 to the convict escapee William Buckley. The anchor of the Joseph H Scammell at Torquay is the first memento of the countless s shipwrecks along the southern coast of Australia in the 1800s. The Cliff Walk at Aireys Inlet is a Cornish postcard of multicoloured cliffs, sea caves, offshore stacks and an elegant lighthouse. From Split Point Lighthouse, the track crosses Painkalac Creek and heads into the coastal ridge to a stunning lookout over Eastern View Beach. At Lorne the route leaves the coast to follow old tramway tracks into the beautiful waterfalls and rainforest gullies of the hinterland. An enchanted track along Cumberland River leads to the Cumberland Track that runs along the ridge tops on an old, unmarked, overgrown logging track. The Federation Track then wanders back to the cobalt sea peeping through towering gums at the tiny seaside settlement of Wye River. 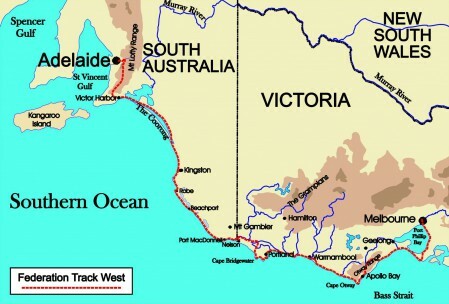 The Track then climbs back into the Otway Ranges to cross the Kennett River and climb up to Mt Sabine through leafy cathedrals of Blue Gums and Manna Gums before descending to the coast again through green pastures with incredible panoramic views of Bass Strait and Apollo Bay. 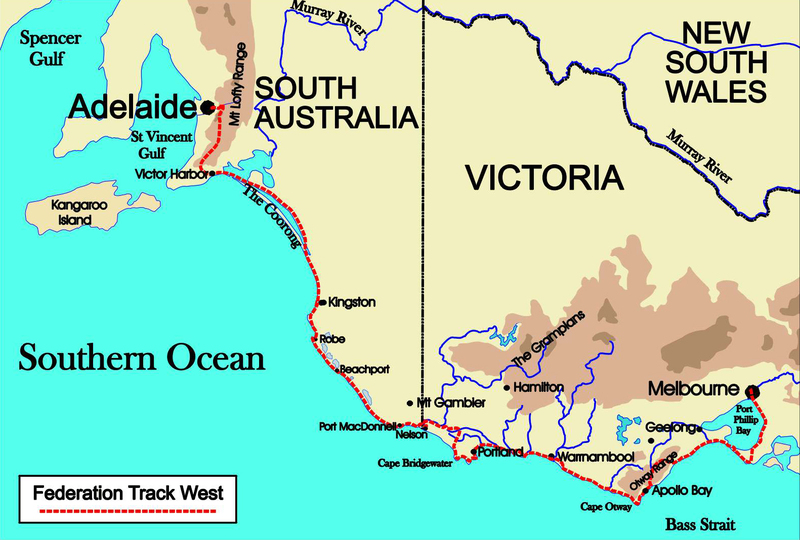 Here the Track links with the Great Ocean Walk and some of the most spectacular coast walking in Australia. One day you are wandering through towering forests of Mountain Ash, the next day the track winds through wind-twisted groves of Messmates and Manna Gums. The next day, you wander above a magnificent, deserted surf beach before following a fret-worked cliff line. A gentle incline up an old coaching road provides views of lush green fields on one side and, on the other, a coastline of jaw-dropping splendour. You return to the coast and ramble past hidden coves and fern-lined creeks. Every time you climb, you are rewarded with stunning views and every time you wander along the beaches and rock ledges there are new sights and old wrecks to be seen. Wildlife abounds with plentiful koalas, wallabies and the occasional echidna. All too soon you encounter the world-famous Twelve Apostles from a completely different viewpoint.